I am 2 hours and 15 minutes from my NaBloPoMo Friday posting deadline. Eek! … and then it hit me. Well I can’t take too much credit. Let me back up. After my foodie question of the day, I got some comments, a couple emails, multiple tweets and direct messages (DMs) from readers expressing their surprise at my cupcake pop aversion. I guess it’s kinda silly being a self-proclaimed cupcake-ista to be afraid of making cupcake anything but what can I say? I am. But after some encouraging tweets from Bakerella (The Cupcake Pop Masta!) and some lyrical ♫♪words♫ from twitter partner in crime, Rebecca from Ezra Poundcake, I’m throwing down the cupcake pop challenge! I’ll be doing my cupcake pop thang this Sunday, March 29th. If you wanna hold me accountable play along, feel free to put your big girl apron on and get your hands dirty! I don’t care which pop you wanna make. You wanna follow exactly what Bakerella did? Cool. You wanna adapt or do your own thing? Even better. Fine print: Post your pictures, experience, tips, suggestions etc on your blog by Sunday 1159pm PST. Feel free to use my banner. Linking me is optional. (Linking will alert me to check out your blog though.) I’d say that linking Bakerella would be a nice and appreciated gesture. Sounds fun, Clara? What do I get for participating? Entry filed under: blog event. Foodie Question of the Day	Let’s the popping begin! Consider this me tossing my apron into the ring. Ready to make with the pops! Me too! (: I’m in! oh yes. but I’m probably going to do the bites instead cos i cant seem to find the sticks here in Melbourne =( is that alright? I feel like I can’t possibly say no! 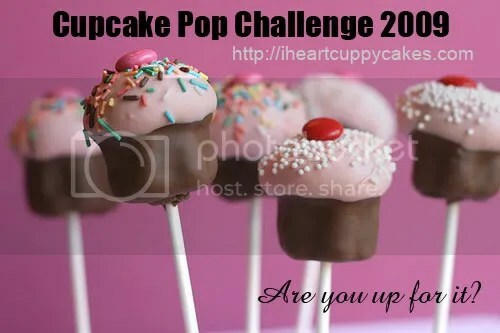 i am making cake pops for the 1st time this weekend :) i’ll definitely post pictures! can’t wait to see pics! I’m in! As mentioned earlier on twitter though… no candy melts, gonna do my best with some chips. No mini cookie cutter either *pout* so I guess they will be (blue!) cake pops. I made the HK and cupcake pops for the first time to share with friends this past weekend (posted pics in my Tumblr). Bakerella’s How-To is pretty clear, but she does have good tips in the comment sections in where she replies to readers. Good Luck! Sorry I missed a few of your posts darling! I have never made a cupcake pop before, but they look fun and I bet they are delicious too. I might or might not be way to late, considering it’s April 10th or something, but I have been making cupcake pops lately.